As I mentioned in my introductory post, the basic pessimistic chart of complete white male median income stagnation is very misleading. However, the picture is bad enough that it does bear an explanation. This analysis will focus on white male personal income in order to avoid complications from the change in household size and the impact of the changing gender and racial components of the workforce. Real median income growth from 1973 was negative, while real mean income growth occurred at only a rate of 0.6% a year. This means that mean income growth doesn’t come close to explaining the increasing gap to between per capita GDP growth and real median income growth. Unless GDP per capita growth has been completely disconnected from the well being of the average person in the economy, there should be some way to reconcile the two. Some people think that the explanation is that the rich have rigged the economy in their favor so all of the improvements have gone to them. If this explanation was true, we would expect to see mean income diverge much from median income than it actually does. If the rich getting richer is the reason for flat wages and it is not fully captured by looking at mean income instead of median income, then corporate profits are the next logical place to look. 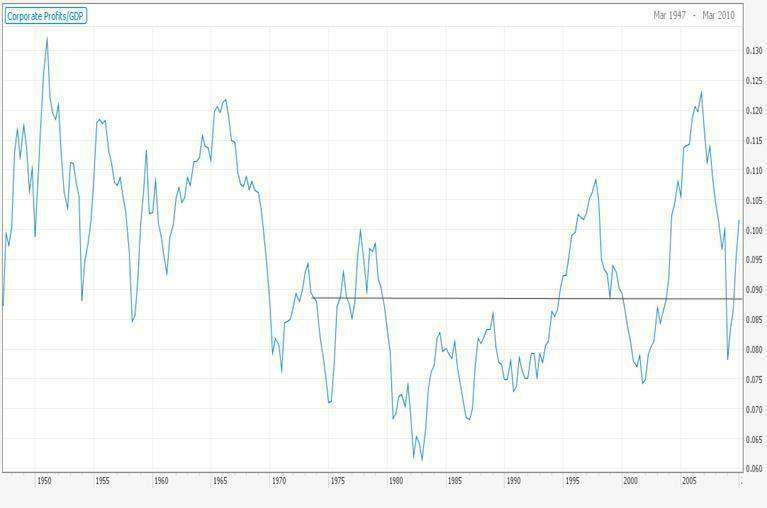 The below chart shows that there has been no drastic change in corporate profits/GDP since 1973. While looking at GDP per capita we should acknowledge that there is a problem when comparing real GDP and real personal income from the census; these time series are deflated by different indices. The GDP deflator has not risen nearly as much as the CPI index, as the CPI Index counts the oil increase while the GDP deflator only looks at domestic goods. Deflating the mean male income by the GDP deflator instead of CPI gets us a little bit closer to the increase in GDP per capita, but there is still a 55% difference that has yet to be explained. A large part of the gap is explained by the changing nature of pay over time. In 1973, total compensation consisted of 73% of personal income and this dropped to 65% in 2008. Wages and salaries consisted of 87.4% of total compensation, dropping to 81.4% in 2008. If the wages had remained constant as a percentage of personal income, the median income would be 22% higher today. This approach yields a lower value to benefits that I found when looking at the employment cost index (Which by some measures has increased by almost 250% since 1981, explaining all the difference between median income and per capita GDP growth). When the changing nature of pay is combined with the other factors, this helps close the gap between per capita GDP growth and the change in while male income since 1973. Much of the rest of the difference can be explained by the changing workforce participation numbers. When adjusting for this additional factor, the difference between median income and per capita GDP is almost fully explained. At times, the adjusted factor is higher than the per capita GDP, but since white males earn on average more than females and other ethnic groups this is to be expected. The below table explains why median income differs from per capita GDP, but it also explains why real income has been flat in the census data since 1973. From this table, we see that when looking at why median income and per capita GDP diverge, the changing nature of pay from total income to benefits is the most important variable, followed by changes in the distribution of income, differences in inflation calculation and the changing nature of the workforce. If the changing nature of pay is broken up into wages vs. total compensation and other forms of income, then benefits would account for 11% of the change with transfer payments and asset income explaining the rest. Understanding why the real median income has been stagnant is interesting, but the situation is much more complicated than the simple graph would lead naïve readers to believe. It looks like you posted the total employment to population ratio, but surely the (white) male employment to population ratio is what you should be adjusting the figure by. Also I would like some more explanation of how you adjusted for wage vs. income. Some of the income will be in the form of benefits like healthcare, some of the income will be in the form of dividends and capital gains. These things aren't wages or salary but are they counted as income in the initial graph of mean income? Are you perhaps adding in an increase in non wage income twice? 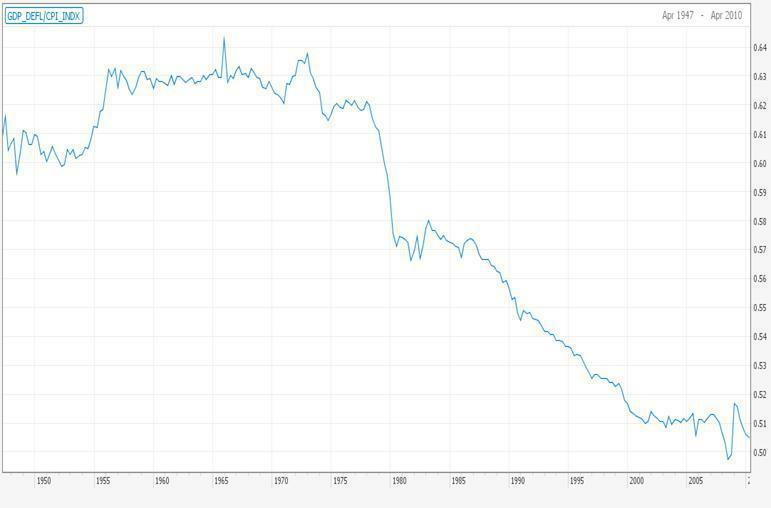 or is the initial graph of mean income really supposed to be mean wage income. Just need some clarification on what exactly you did there. Looking at white male income is a large part of the reason why there is a remainder that is unexplained. The dividends and capital gains would be counted in income, but not total compensation. Healthcare would be part of total compensation. The chart "The Changing Nature of Pay Over Time" looks at how these subtotals have changed over time. You have omitted government spending in the GDP/capita discussion. My guess - G per capital has risen substantially in real terms over this time period. Outside of transfer spending (which should show up in income figures either way), government spending has not noticeably increased.